If you’re a member (if not, why not? ), you should receive a ballot paper to your home address very soon. Please don’t ignore it. It’s your opportunity to decide who you would like to run the union on a national basis for the next two years. Of the full National Executive Committee of 67 people, we can vote for Higher Education seats, Regional seats and National seats. Please take time to read the election addresses and make sure you post your votes back by the 17th May deadline. If you don’t get a ballot paper by the end of April, the chances are we don’t have your correct address. If so, please let us know so that we can fix it and get you a new ballot paper! 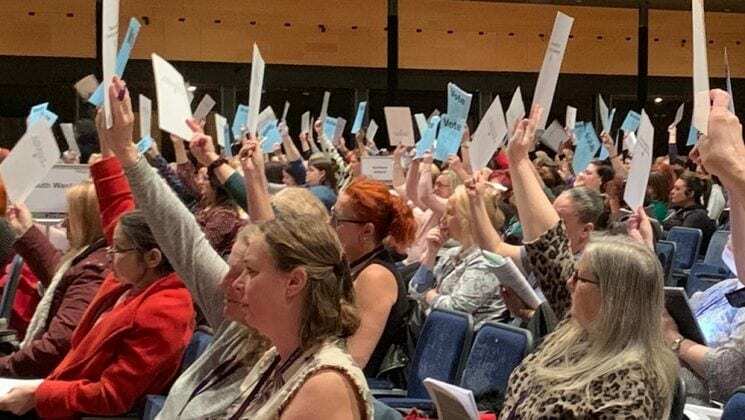 UNISON Women’s Conference 2019 – A delegate’s and visitor’s perspective. As last year, this was an interesting and lively conference, covering a wide range of topics too numerous to mention in a short report. What follows here are some highlights for me, and possibly some ideas or campaigns for branch committee to highlight to members. Conference got off to a lively start with its prioritised motions, the first of which was campaigning for Safety within the Social Care Workforce, which continues to be live issue with the Birmingham Care Workers, who are continuing their industrial action. The discussion focussed on the commodification of care, looking at time issues, travel and continuity, amongst other things. Since the privatisation of many of these services, profit would seem to take precedence over care and safety, for both carers and their clients. Care also surfaced later, highlighting the number of women carers who give up paid employment, or go part time in order to care for family members, and underlined how there is an absence of good workplace policies. Unison has published new guidance on this. Several motions with health, safety and wellbeing, mental and physical, in the workplace were also passed on the first day and included all aspects of women’s health. A database should be up and running within 6 months, to include details of support groups and campaigning organisations, general wellbeing information and policy info. Pensions featured again this year, this time via the Back to 60 Campaign, who are raising the issue of pension fairness for women born in the 1950s, much like the WASPI campaigners who came to last year’s conference, but with a different focus, which is to ensure that the state pension age is kept at 60 for women born in the 1950s. The campaign has been successful in securing a Judicial Review, which will take place on the 5th and 6th of June this year. Reciprocal pension arrangements for black women were also discussed, highlighting the fact that it’s where you retire to, not where you’ve paid in that determines whether your state pension increases year on year. Whilst EU citizens, and those in some other countries, e.g. America, have reciprocal agreements, most Commonwealth countries do not have this (with a few exceptions) and it affects predominantly black women. Sexual harassment was discussed, both inside and outside the workplace, as well as the Ask for Angela initiative, to help young women gain assistance to extract themselves from an uncomfortable or threatening date. This initiative is to be promoted over the next year and reps invited to the 2020 conference. Women and debt was on the agenda too, from the increasing use of food banks to period poverty. Conference encourages all branches to set up sanitary protection donation and collection points. The Red Box project was at conference to take donations. Maternity rights were also discussed in several motions, including support and rights for those who have experienced miscarriage or stillbirth, and rights during maternity leave as well as in the workplace. Unison passed motions to update its own guidance and report back to conference next year. At the other end of our reproductive lives, Menopause was also on the agenda, highlighting the need for guidance for employers. There were 39 motions altogether, and Conference got through them all, finishing at 1pm on the Saturday. All in all, an enjoyable and illuminating three days, covering a wide range of topics pertinent to today’s workforce. Speakers included the Labour MP for Tooting, Rosena Allin-Khan, the shadow minister for Sport, who gave an inspirational account of her own life from her education at the local comprehensive, to Doctor to MP in 2016, holding Sadiq Khan’s seat (no relation) with an increased majority. A final note on a workshop I attended, run by an organisation called Let Toys be Toys, a campaign started in 2012 to challenge stereotypes around signage in shops, labels, packaging, catalogues and marketing. Examples of marketing in the 1970s through to the 80s, when my children were born, was much more even-handed; multi-coloured toys played with by girls and boys, including items like toy kitchens and trains as well as Lego. More recently, there has been a distinct pink-blue divide in everything from signage to packaging to shelf placement, and toys are more gendered now than at any point in the 20th century. It’s quite shocking to me that my 3 year old granddaughter is targeted in a way that my own children, including her mother, born in 1984, were not, bombarded now by pink everything, and even girls’ versions of what I thought were gender neutral toys, from Lego to cameras. The campaign has been very successful so far, persuading no less than 14 retailers, including Debenhams, Tesco and Morrisons, to change the way they sell and market toys from gendered to general. Now it’s time for manufacturers and advertisers to change too. I attended conference as a delegate this year which meant I got to vote on all of the motions which was great. Julie has mentioned broadly the main sorts of issues that were covered so I will just talk about the few issues that caught my interest. For me two of the most engaging debates were about motions on LGBT+ inclusivity and Trans Women. Work with the National LGBT committee to circulate information to branch and regional women’s groups on what the name change means. Encourage regional and branch women’s groups to campaign for support for any rule change proposal from LGBT Conference to National Delegate Conference regarding changing the name of the group to LGBT+. The background to this was that it followed a motion from the national young members’ forum to 2017 LGBT conference highlighting the growth in the number of people, and young people in particular, identifying their sexual orientation and gender identity in many different ways beyond a binary definition, and expressing their preference for the LGBT group to organise in a more inclusive way. The LGBT SOG then had a consultation to which the overwhelming majority of the consultation responses, and all of the regional group responses, were in favour of the changes and the national LGBT committee therefore submitted a motion to 2018 national LGBT conference proposing changing the name and working to make the group more inclusive. Work with the women’s committee on eradicating transphobia within UNISON. Work with the national LGBT committee to create and promote the role of Trans Ally as a buddying role across all branches. Distribute the UNISON trans policy to all Regional Women’s Committees and Branch Women’s officers to ensure support for our Trans sisters is disseminated through the women’s network of UNISON. Work with Stonewall in order to educate all women’s in term of the Trans community and the hate they face. Ensure that all transwomen members are aware of the support that is available to them. The reason I was so fascinated by the reaction to these two motions was that there was a definite shift in Women’s Conference attitude to both these issues compared to last year. When a motion on non-binary inclusion was put forward at last year’s conference there were a whole raft of speakers against. The speakers indicated they didn’t understand what non-binary meant, that they were concerned about toilets and changing rooms who might have non-binary or trans women using them, that it was a ‘complicated argument’ and they encouraged women to vote against. Thankfully that vote was won last year but this year there was not one speaker against either motion and the vote on both was an overwhelming accept, I actually didn’t spot any votes against. I was glad to see that UNISON is evolving and views are changing, and it makes me hopeful that younger people will see the union as more representative of their views. I attended a meeting on Education where FE, HE and school issues were discussed. The main chat around HE was on pay with one university saying that they were sure they got a large reject vote in the last ballot and were keen on the HE Service Group exec committee considering a disaggregated vote in the next pay round. I explained that there had been no definite decision yet on how to run the ballot and that the HE SGE would be discussing that in future meetings. I also let the meeting know about our success in getting UNISON members in our Student Union pay adjusted with 2 years back payments when our branch secretary discovered that term time only members were not being paid correctly. I suggested that other branches checked with their Student Unions to see if their pay was all in order. Overall it was a very interesting conference and although the motions were mostly non-controversial and voted through easily, as always, it’s often in the breaks when you get to meet women from branches all over the country and hear their experiences and how their branches organise which are some of the most illuminating conversations. I’d like to express my thanks to the branch from both me and Julie for the opportunity to attend. Thanks to all those members who made it to the AGM this year. We had another great turnout, excellent speakers from the Bakers’ Union at Wetherspoons and some very good discussions on the way forward. As a trade union, assisting people to leave their jobs is not, ideally, what we’d be doing, but we aim to provide help and assistance to all our members, whatever the circumstances. If you are going through the process, here is a rough guide to it and what we can do to help you. If you’ve indicated that you want to go ahead with the settlement, HR will send out hard copies of the legal document as well as emailing a pdf to you. You need to have legal advice and a signature from someone who is qualified to sign this type of document. The University will pay the £350 plus VAT that should cover the cost. As a UNISON member, you can either use UNISON’s solicitor, Thompsons or find one yourself. There is no real advantage to using Thompsons and if you’d prefer a face-to-face discussion then you may opt to go to a high street solicitor, but the option of using Thompsons is available. You read the document, check the amount and make sure there is nothing that you are unhappy with. You send the pdf of the agreement to unisonhelp@brighton.ac.uk, and we will also need you to confirm your contact details – name, address, email, contact number. The phone number is important because Thompsons will use this method to contact you. We will send off the electronic version of the agreement and your details to Thompsons. Thompsons will check the paperwork and contact you directly to discuss it with you. They will check that you’re happy, answer any questions and make sure you understand the nature of what you’re about to agree. If you still wish to go ahead, Thompsons will sign the document and arrange to send their signed copy to you. This is your last chance to withdraw from the process if you change your mind. On receipt, you sign the document yourself and then return it to the University by the deadline. The University will sign the document and this then becomes a binding agreement that neither party can withdraw from. You will leave on the agreed date and your final salary payment will include your wages for the month as normal and the settlement amount. They will probably assume that you’ll take any outstanding annual leave before you go. Thompsons will reclaim their costs from the University, so there’s no need to worry about that. If you’d sooner use your own legal people then the process will be similar, and again, the responsibility of getting the signed paperwork back to the University on time will be yours. We can recommend https://www.pureemploymentlaw.co.uk/ (01243 836840) or you might want to use a solicitor you are familiar with if you have one already. There’s no need to panic about the timescale, but we would suggest that this is done as early as possible to avoid the University potentially withdrawing the offer if the process is not complete on time. We would, however, urge all members wanting to use Thompsons to get the emails back to us as soon as possible. If you end up leaving the University, we hope you go on to greater things. Thanks for being a member and giving us the strength to campaign for all workers at the University. Obviously, we would encourage you to make sure you’re in a trade union in your next job and ask others to join. If you’re retiring or just taking a break, we would encourage you to think about becoming a retired member or an unemployed member. Retired membership costs £15 for life – just fill in a form and send us a cheque. Unemployed membership costs £4 a year and lasts for two years – just send us a cheque for £4 and we’ll amend your membership status. If you have any questions on any of this then please feel free to get in touch with your local rep.
Wednesday 6th March at 12.30pm, Cockcroft Hall, Moulsecoomb. A free buffet lunch will be available from 12pm. We’re always very happy with the number of people who can make this, so please come along if you can. Please complete our survey if you intend to be there. All members have the right to attend, so if you give your line manager notice that you want to, they should provide cover where necessary. If you’re travelling from outside Moulsecoomb, we’re happy to pay reasonable travel expenses as long as you have the receipts. UNISON’s annual conference of higher education branches and members took place in Nottingham in January. Our branch was represented by Dan Simmonds and Sian Williams as delegates, with Alan Dilley there as a visitor and Sarah Pickett and Ivan Bonsell attending as regional reps. The conference is the decision making body for the union, as far as Higher Education is concerned, and aims to guide the Service Group Executive in its work during the year, overseeing what branches are doing and trying to develop the work of branches in delivering meaningful results for our members. Seventeen motions were debated, most without much controversy. Many were committing the union to do various bits of campaigning over issues of which members will be familiar, such as a 35 hour week, academy schools, pensions, outsourcing and equalities. Part of the issue with UNISON conferences is the difficulties of getting motions and amendments onto the agenda. The Standing Orders Committee decides what can and what can’t be discussed as conference business. Of four amendments submitted, only one was allowed and all three emergency motions were deemed to not really be emergencies. Dan and Sian met with the Standing Orders Committee several times but they weren’t budging on their decision. Our emergency motion on how to deal with the outcome of the Augar review of higher education funding was, frustratingly, not discussed at all. The one amendment which did make it as far as the conference was our branch’s amendment on pay dispute tactics and this did, quite rightly, provoke some debate. There was no debate on the substantive pay motion, which commits the union to demanding an August 2019 pay increase of 3% plus whatever the retail price index is (RPI, currently about 2.7%). This demand is combined with a 35 hour week for everyone and meaningful progress for all universities to eliminate the gender pay gap and become living wage employers. The amendment moved by Sian, on behalf of our branch, would commit the union, in the event of a pay dispute (which is likely because we’re not going to be offered 3%+RPI without the threat of strike action! ), to organise a ballot of members on the basis of a disaggregated ballot. This is a way of dealing with the anti-democratic Trades Union Act, which prevents unions legally taking industrial action without a 50% ballot turnout. A disaggregate ballot treats each university pay claim as a separate dispute, which would mean that we’d only need a 50% turnout here to take action, rather than aiming to achieve it across all universities. We’ve explained this before, in January’s newsletter and elsewhere, but the view of our branch is that this is a much better tactic than hoping to improve on last year’s 31% turnout within a year. Having another aggregate ballot nationally this year is almost certainly a case of doing the same thing and expecting different results. Anyway, the debate took place with good contributions on both sides, but our amendment was lost by about 60-65% of the vote of delegates. This means that there will still be some debate about how to progress the pay claim, but it may be that those of us who advocated a different approach will have to wait until we can win the argument. If you have any questions about the conference or the pay claim feel free to get in touch, in the usual way. Our branch sent delegates and visitors to this year’s higher education conference in Nottingham last week. but for a more complete and honest assessment of what was discussed, you’ll need to read our branch’s report, available here and in the newsletter soon. Hi all, a belated Happy New Year to all our members, and if you’re reading this and you’re not a member then please have a long hard think about joining. Our final newsletter of the year is out now! You can find it in the usual place (top right hand corner, Newsletters, obvs.) Please let us know if you have any comments or questions. I’ve been asked to say hello to Anna and all her friends at school, so if you’re reading this, hello! Apologies for this month’s newsletter appearing a bit later than usual. You can find it in the usual place – Newsletter shortcut in the top right-hand corner, where you can find back issues as well.